We've been having a bit of a media fast for the month of March, which has been amazing. But the deal was we would still take the time to watch any DVDs that I had the opportunity to review. We also still watch a couple of things for school, but really, the television has stayed mostly off. It's been a great March so far. And it makes it so that we all pay a bit more attention when we do turn the thing on. Watching The Woodcarver was a solid reason for breaking this media fast. Matthew Stevenson is a troubled kid from a broken home. When he vandalizes the local church to get back at his parents, Matthew has to repair the damage to the church to avoid criminal charges. While working at the church, he meets Ernest (John Ratzenberger), an accomplished wood carver who created the intricate woodwork decoration that Matthew destroyed. Ernest has become something of a hermit, but reluctantly comes out of reclusion to help repair the church. Now Ernest and Matthew must work together to preserve the church's beautiful antiquity, and along the way, they also manage to restore their faith in God and in life. We really enjoyed the movie. 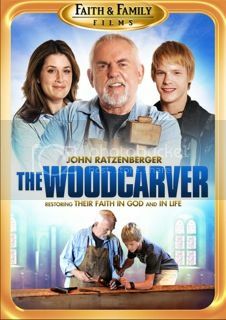 John Ratzenberger is always great, and he was believable as a widowed woodcarver. The interaction between Ernest and Matthew was great, and for me it was a fabulous reminder of the importance of mentors and role models for my teen boys. The Woodcarver will be available on March 13... but you can win one here! I have had many adults in my life who made a difference. But the 2 that made the greatest difference is my parents. They brought us up in the Christian faith. It wasn't until I was in my 30's that I realized my need for Christ. We are always looking for good clean movies to watch. Thanks for the chance to win. For my entry I would have to say that my Mom was my mentor. She set such a great example on being a Mom and a wife. I see this now looking back and wish I would have paid more attention back in the day. My parents. No matter what was going on, they were solid. And such a good example of what it means to be married to your best friend. My mom, of course! She was amazing! Growing up my mom always worked & went to meetings & groups in the evening. She was never home. My friend's mom didn't work and when I stayed the night at their house she would lay in bed with us on Saturday morning and watch cartoons. I knew then that I wanted to stay home with my kids. My mother has always been a good mentor in my life.